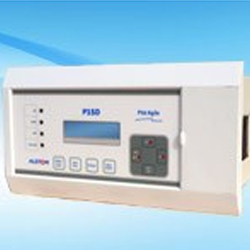 The P15D is a dual-powered non-directional overcurrent and earth fault relay. It provides protection for applications where no external auxiliary power is available or the auxiliary supply does not guarantee the dependability required for protection applications. This relay is mainly designed for medium voltage and low voltage industrial installations, distribution network substations and more specifically in ring main unit (RMU) networks for protection and monitoring purposes. It may also be applied for direct refurbishment of substations using older induction-disc IDMT overcurrent relays, as the P15D energises from the line current transformers, in the same way that the disc relay derived its operating power source from the CTs only. The main protection functions in the relay are timed and instantaneous phase and earth fault protection, with up to 3 independent stages available. IEC and IEEE curve types are provided for IDMT functions. Thermal overload, cold load pickup, inrush blocking and multiple setting groups add to the application capabilities of this versatile relay. The P15D offers supervision functions including measurement, monitoring and recording. Industry and utility protocols such as MODBUS and IEC 60870-5-103 are available for transmitting relay data to a supervisory control system via communication networks. The user-friendly operator interface facilitates easy reading of measured values and simple configuration of the relay.